Printing custom stickers continue to be a favorite marketing tool for any size business. Whether you want to increase brand awareness or promote a product, service or event, our custom foil stickers can help spread the news. 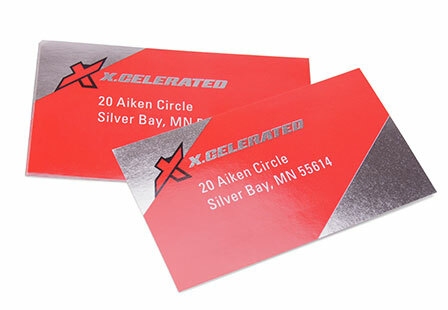 Also referred to as cold foil, you can select from a broad range of colors including silver and gold, making your stickers stand out. These stickers are durable, versatile, and can stick on a variety of surfaces. Inline foil stickers are intended for indoor use only. Select from a large selection of sizes and quantities to meet your personal or business needs. Please Select 2" x 3.5" 2" x 4" 2" x 8" 2.5" x 3.5" 2.75" x 4.25" 3" x 4" 3" x 5" 3.5" x 3.5" 4" x 4" 4" x 6" 4.25" x 5.5" 5" x 7" 5.5" x 8.5"